IDW begins the run into the third Transformers movie in December. These three beauties, the best of the months covers in their range. 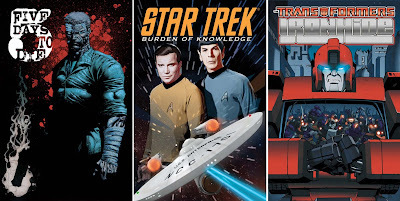 ARTIST AND TITLE (Left to right): David Finch - 5 Ways To Die #1, Federica Manfredi - Star Trek: Burden Of Knowledge, and Casey Coller - Transformers: Ironhide. Full December IDW solicitations after the jump. Just picked up 5 days to die and it is really interesting too bad is a mini. It sure do have a large cast!!! Thanks for that IFF, some mini's just are far to short aren't they! Yip saw the new H4H teaser when I woke up this morning - awesome start to the day!